When I think of apartment living in LA this is the type of building that comes to mind. I've always loved these kinds of buildings, and apparently LA went through a boom of these in the 50's and 60's. These buildings are referred to as "dingbats". You'd think they were talking about the people that live in them but it's descriptive of the fancy ornaments pasted on the buildings to give them individuality. The individual building names were fancy too. Well I'm not going to just regurgitate what I read but please check out these links, especially the Wikipedia article. 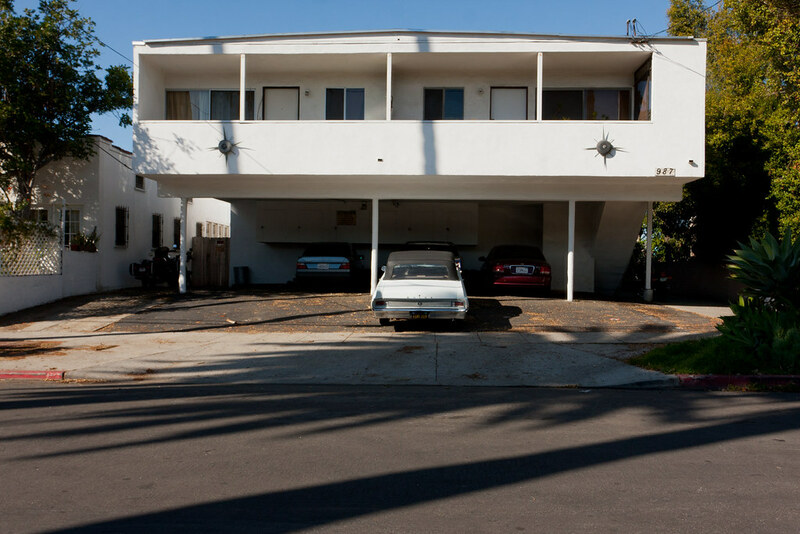 "Since each unit typically had a private entrance, stucco boxes offered an affordable version of the American Dream to city dwellers who aspired to owning a detached, single-family home, and with on-site parking, dingbats participated in the car culture of postwar American life." "By mid-century, a development-driven southern California was in full stride, paving its bean fields, leveling mountaintops, draining waterways and filling in wetlands...In our rush to build we tolerated monumentally careless and unattractive urban design...Some of it [was] awful—start with the 'dingbat' apartment house, a boxy two-story walk-up with sheltered parking at street level and not one inch of outdoor space." Well I'd sure like to live in one, maybe I will one day. What a great thread! I kind of like them especially when they're lined up on one whole block. It's the 70s thru the 90s that I have a problem with. I love the older apartments from the 20s, 30s and the 40s. Overall LA's architecture has some real gems throughout the city. Its so unique here imo. Didn't a bunch of apartments like that turn into pancakes in the Northridge quake? Yup, due to the "soft first story" with the tucked under parking. If I chose to live in one of those, I'd pick an apartment on the other side. Personally, I think dingbats are rather ugly. But to each his/her own! Probably the main reason they were zoned out. I love MCM! 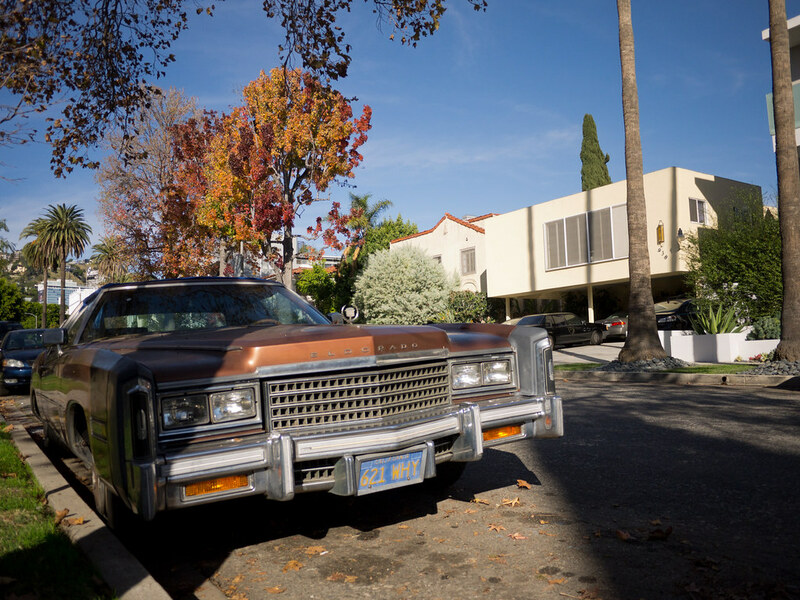 The Dingbat is quintessentially LA, and can be found all throughout the city. Interestingly enough, these are starting to receive attention from historic preservationists and activists. Typically, buildings must be 50 years old in order to be considered "historic." Nice Photos King of the Hill but I think most of those apt buildings are UGLY. The most offensive feature is the placement of car as king in the front totally obliterating the streetfront/sidewalk/pedestrian connection. San Diego had its own local version of this type of architecture which is called the "Huffman". The main difference is that there is no over hang in the front under which the cars parked. After decades of community opposition, this type of construction was outlawed in San Diego, though a lot of damage to neighborhoods had already been done. 1) Many of these types of apartments had no windows facing the street which made the street a walled off, unsafe area for pedestrians, and became a place criminals could lurk without being observed. 2) This apartment style is anti-pedestrian because of the wide curb cuts for cars to pull into and out of their parking places. The parking provided was barely adequate in quantity for those who lived in them, while at the same time the wide curb cuts eliminated street parking so visitors had no places to park. 3) Because the front of the building was devoted to parking, the street scape was devoid of landscaping and trees, and made for a very sterile and brutalist community environment. It probably wasn't just earthquake hazard that zoned these out, but the reasons I give above. There is a radical difference between this style of architecture and the apartments of the 20s, 30s & 40s, which typically had landscaping, parking was tucked in back, and they still have some connection with windows looking out on the streetscape. To the left of the Hansen above you can catch a glimpse of what looks like a 1920s era apartment building that probably has none of the negative attributes of the Hansen. 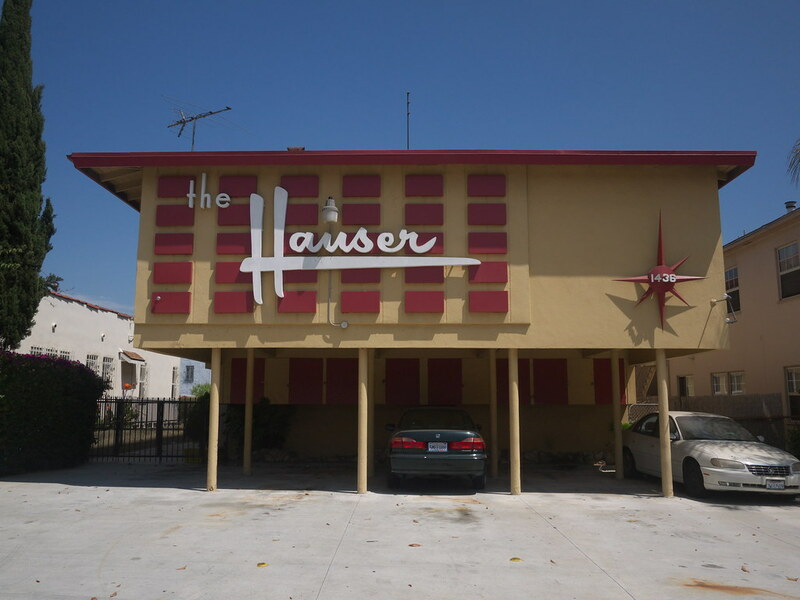 Now is there something kind of kitschy and compelling about the "The Hansens" signage, front square design feature, and starburst decoration? Yes. But the actual layout of these types of buildings were an unmitigated disaster for cities all over California. There has been talk about preserving a few of these types of buildings in San Diego, but only to offer them up to history as an example of what should not be done and should never be repeated. Like the cold water walk up tenements of New York's Lower East Side, no one will miss their passing if by the grace of the development gods we can someday be rid of them and have them replaced by something better.